In this stress-ridden life in big cities where you are trying to strike a balance between your personal and professional life, it is always beneficial to take out some time and take a vacation to rejuvenate yourself. Most of the people prefer taking vacations and visiting tourist spots for sightseeing and relaxation. However, there are few who seek adventure in these vacations and want to add some thrilling moments to their memory before they go back to their mundane lives. 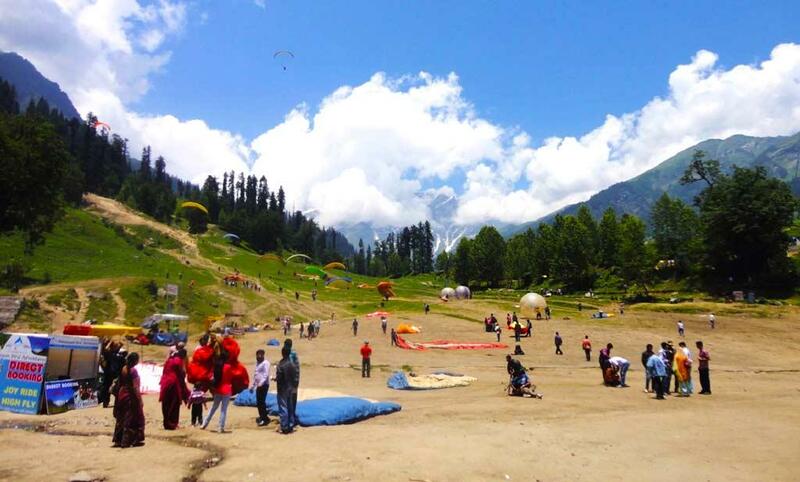 One such place for adventure lovers is Solang valley in Manali. It was the first week of July when we visited Manali. The summer vacations were over but the place was still very much crowded. It was a pleasant sunny day when we started our journey from our hotel. The distance between Manali and Solang valley is around 13 km. The road leading to the valley is very beautiful as you get to see the lovely mountains in distance and lush greenery. Due to the hilly terrain, it took some time before we reached our destination. This will be the first thing to attract your attention once you reach Solang valley. ATV stands for All-Terrain Vehicle. As its name suggests, this vehicle can be used to drive on all types of rough terrains. These vehicles are available at the base of the valley as the vehicles don't go all the way. You can either walk all the way to the valley or hop on ATV. Anyone seeking a unique experience will definitely go with the second option. Now here you need to be a bit careful. The ATV operators will be giving you two options. 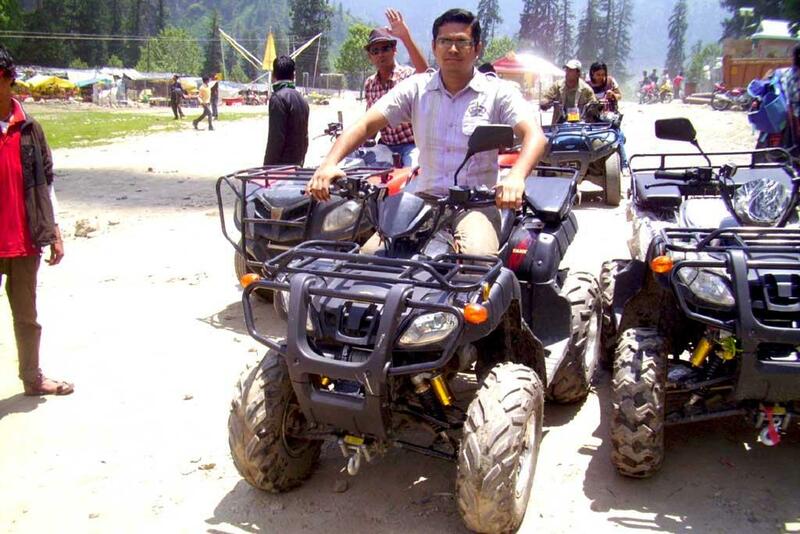 One is to ride in the ATV driven by their men right till the valley and second is to drive the ATV yourself. Of course, the driver will be there to help you because driving ATV isn't cakewalk for all the people. These operators charge you more if you want to drive ATVs. Be very clear in the beginning itself whether you want to drive or be just a pillion rider. This is because sometimes the driver offers you to try driving for some distance in the mid-way and then they charge you for that. It happened with me as I had to pay for driving the ATV even though I had drove it for less than half the distance. The very first glimpse of Solang valley is mesmerizing. You see a vast expanse of land with tall trees on the fringes. In the distance you can see tall mountains in the background. It's a surreal view and for the initial few seconds you will be awestruck with the beauty of the place. Thereafter your focus will be diverted towards what's going around in that place. You will be seeing huge balls rolling on the ground and parachutes in the sky. 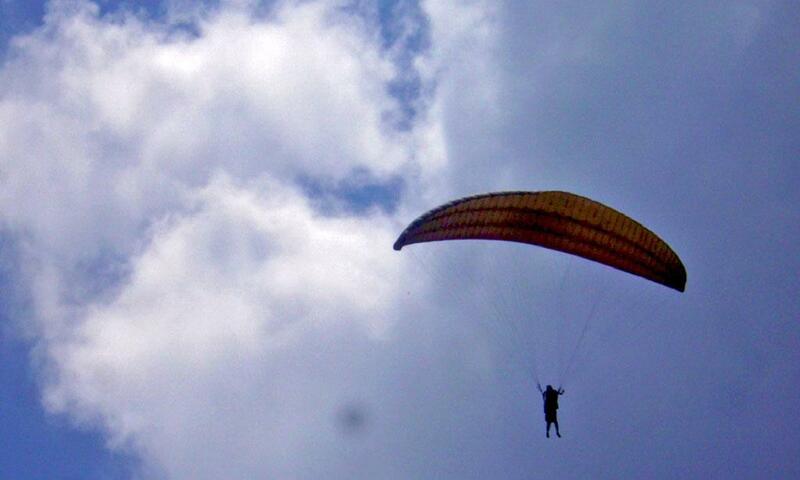 Paragliding is one of the most wonderful adventure sports out there. Nothing beats that feeling of flying in the air like birds. It is one of those unique experiences that you want to have at least once in life. Now paragliding is certainly a bit dangerous sport, but the operators conducting them are very efficient. All the safety protocols in terms of process, gear etc are followed. The pilots are hugely experienced fellows who view paragliding not just as a job but as a passion. Paragliding is a bit expensive affair and will cost you upwards of 2500 depending on season & various other factors. You also need to pay for the Gondola ride that takes you to the point from where the paragliding begins. So ensure that you carry enough money in your pocket. 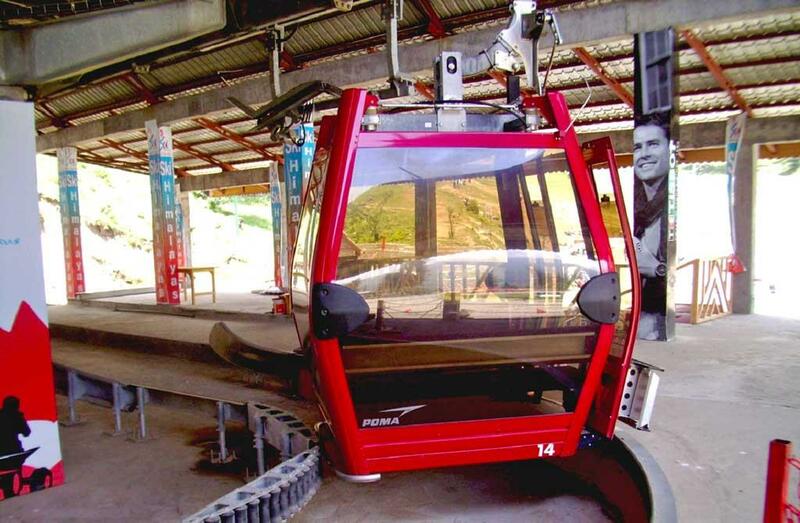 The gondola ride is also a wonderful experience, mostly due to the scenic beauty around you. It also gives you an opportunity to relax before you begin your thrilling ride under the skies. Three of us decided to go for paragliding and there was one driver with each of us. After getting down from gondola, we walked for some distance and got to the point from where the paragliding begins. We wore all the harness and safety equipment like helmet. Now the beginning is the only tough part in paragliding. This is because you have to run towards the edge of the cliff in full speed with your pilot right behind you. This is called launching. In this process, as you move forward, the wing is inflated and after a while you are launched into the sky. The problem here is the backward pressure created by the inflated wing. Due to this you are dragged in reverse direction if you don't run with your full steam in the forward direction. My friends had successful launch in the sky, but I had two false starts. It shook my confidence a bit. But with the help of another pilot, we finally succeeded getting into the air in the third attempt. Next twenty minutes were one of the most wonderful moments of my life. It was literally a bird's eye view. Hovering in the air I could see the whole valley. I could see the topmost branches of the tall trees, the Snowclad Mountains in the distance and feel how it feels like being a bird. It is really very difficult to put that whole enthralling experience in words. Getting back to the surface also involves a bit tricky part. Just before landing you need to bring your both legs in front of you, just like when you are on a swing. This is to ensure that you don't hurt yourself if landing is a bit rough. However, you will always find people there on the ground to help you land safely. The moment you land, you will be approached by the cameramen/photographers who had clicked your thrilling ride. If you wish, you can purchase the CD from them. Zorbing ball is basically a giant ball made of transparent plastic. This ball is then rolled on slope. There is seating space for two people. All the safety norms are followed as you need to strap yourself properly before the ball is rolled. 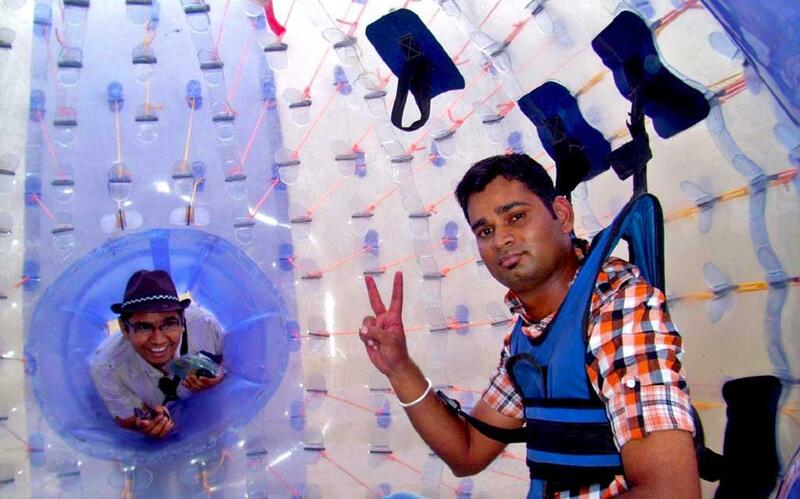 This is another unique type of experience as you get the thrill of going topsy-turvy in a ball rolling down the slope. This ride is not for everybody and people having problem of motion sickness should definitely avoid it. I, and one of my other friends, decided to skip it. Rest two guys tried it and they enjoyed the ride. The adventure trip goes to next level when you move to Rohtang Pass from Manali. Unfortunately, the road was closed for some maintenance activities on that day and so we missed out seeing the pass. Nevertheless, this whole adventure sports experience in Solang valley was worth it and I would definitely look forward to visiting there in winters to try skiing in the snow.